A tip: NTUC sometimes has Avocadoes from Mexico in a bundle of 4 for about S$4, which is the cheapest I've found Avos in Singapore. Most places sells them for about S$1.50-S$1.90 each. Cold Storage retails the Australian Avos for S$2+! Preheat the oven to 180 degrees Celsius. Cut the avocados lengthwise all the way around. Twist the halves and using your knife, strike and remove the pit. With a large spoon, scoop the avocado out of its peel. Then, with a small paring knife, slice the avocado lengthwise. Put the lime juice on the avocados to prevent them from turning brown. Place the avocado slices in a mixing bowl. Add the pepper, the garlic powder, the minced basil, the diced tomato, and the chopped onion. Mix this all together. 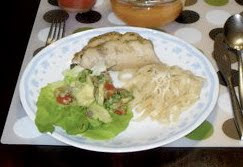 Divide this mixture into two parts, so that you will stuff the chicken with one part and retain the other half as an accompanying salad for your meal. Lightly oil a deep baking dish with cooking spray. Make sure that the baking dish is deep to hold all the chicken stock that will be produced by the chicken. To stuff the chicken, lay a piece of chicken out on a flat surface. Scoop out a spoonful of the mixture and lay it onto the chicken. Roll the meat over the mixture and tuck in the ends. Place the stuffed chicken in the dish. Do this with all of the chicken. Then sprinkle the top of the chicken with the cracked peppercorns. 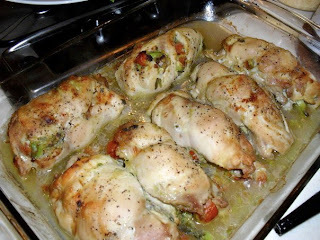 Bake the chicken in the oven for 45 minutes. Serve the chicken with the carbohydrates of your choice. We like it with Aglio Olio fettucini, as we can drizzle the resulting chicken stock over the fettucini.